Most of the time when I make a baked egg dish, it’s a frittata. Crustless and effortless! I love them, and they’re such an easy way to pack in protein and veggies… but sometimes I have to break it up with something just a little bit more special. Pinkies up, folks: it’s quiche time! This recipe was posted and revisited recently on a blog that inspires me CONSTANTLY, Take A Megabite. 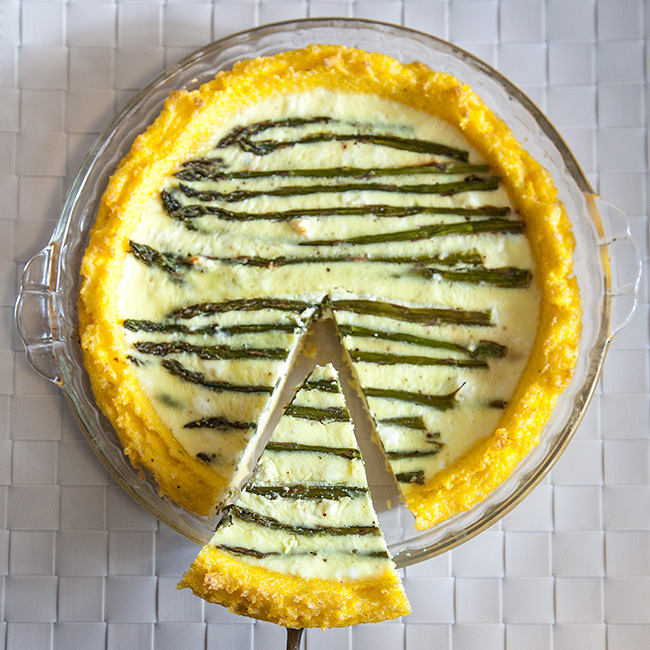 I couldn’t pull out my grocery list fast enough – I mean, cheesy veggie-filled quiche in a polenta crust? You don’t have to tell me twice. After baking it, the thing was just so gorgeous and unique that I couldn’t help but whip out the camera and wax poetic about it over here. Just too good not to share!